Amal Clooney was spotted on her way to teach a class at Columbia Law School on Tuesday (April 3) in New York City. Amal looked so chic in a buttoned white skirt, paired with a black tee and emerald green trench coat. Amal Clooney has a new Soho’s apartment alone. Without children or husband. Love the outfit, not the coat or shoes. She always looks better with big sunglasses. They hide the many imperfections in her face. Grow up Angela, we all have imperfections, that makes us human. Imperfection. This is a joke ….. i hope. Would like to see your face Angela. Please show us a photo of yourself, in order to see a perfect beauty. I’m sorry but the weather is cold right now in NY and we can see that it even rained as the sidewalks are wet. The fact that she is wearing a short sleeve sweather with her coat off makes me think of the Kardashians when they are photogrraphed. None of the outfits you’ve shown Amal wearing lately make her an elegant and credible attorney.Why does she think she needs to show all the time her bony bare legs. She would look much better and elegant if she invested in a nice pair of black pants, a nice black turtleneck a good pair of flats and a beautiful Max Mara coat. All the rest is a woman trying to get noticed for her style. Andrea – I think you have hit the nail on the head. Amal is always expensively dressed in labels- but in truth I have never seen her embody that effortless, understated elegance that truly defines a timeless fashion icon. I am thinking of Jackie Onassis, Audrey Hepburn. This is not a CRITICISM of Amal – understated is simply not her style and every woman expresses her individuality through her clothes. Even when she wears a classic suit she pairs it with a “clingy” bag and does the coy hair flicking more suited to a teenager. Perhaps that’s why the Jackie’s and Audrey’s and Grace Kelly’s are so revered – because they are RARE and authentic. Actually, I think Amal Alamuddin had a better sense of style than Amal Clooney. Sometimes, too much is just to much. Andrea- I think you may be presuming decisions Amal made based on what you would do. Perhaps she has a warmer body temperature than you do. We have seen Amal is shirt sleeves before when it appeared that everyone else was wrapped up. Perhaps the designer asked her to “model” the outfit with and without the jacket on. I guess what I am saying is that none of us know why she chose to wear the coat or hold the coat. As for what a credible attorney looks like you are showing your naivety. She is teaching in a human rights seminar at Columbia. Her credibility as an attorney is not based on what she is wearing. Here she goes again … sigh. Love the outfit, indulging coat and shoes. Trendy and fashionable yet professional at the same time. Very nice take on work/daytime attire. 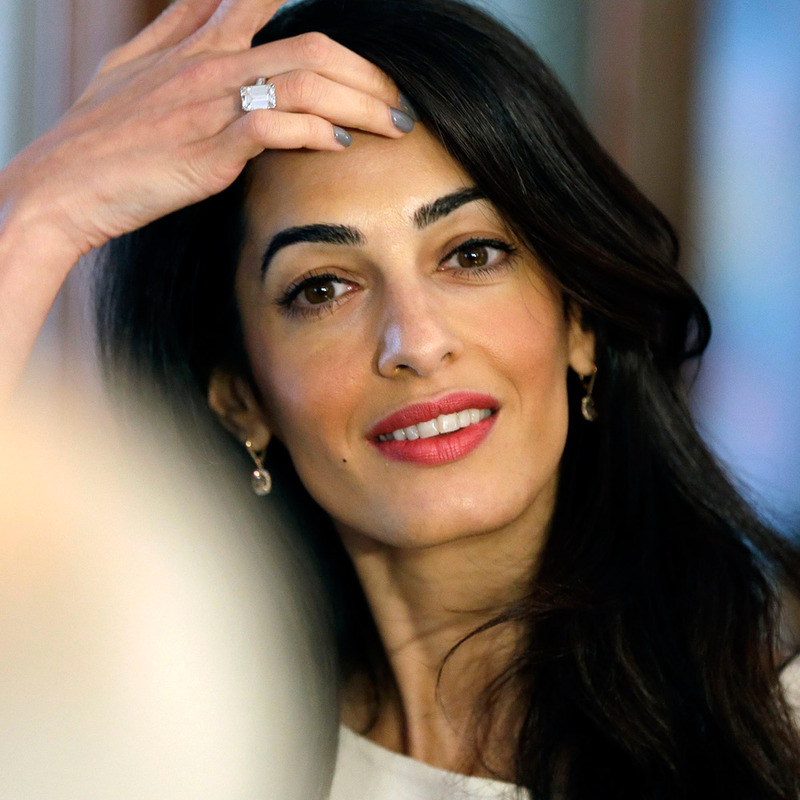 Angela: What are the many imperfections in Amal’s face? Goodness aren’t you a bit over defensive ? Haha you sound like Soos.. it is weird how you two seem to argue sometimes however you both share the extreme adoration for someone that you don’t even know. Let me help: everyone, every person, regardless of the last name, money, celebrity status, etc has imprerfections, it means that we are “humans”, and that’s why there is makeup, photoshop, and of course, plastic surgery,..
Why being defensive then ? IActually like the shoes but I’m into the funky offbeat ones – these shoes don’t get pulled off with a lot of styles in general – call it crazy but they look comfy. DONT LIKE THE JACKET . I find her very interesting, but would love to see different hair styles on her. Her hair can be beautiful, but not always. It seems like a security blanket of sorts for her. She totally uses her hair as a security blanket. For someone who is considered so “fashion forward” and a “fashion icon” she’s so predictable with the hair. Long, straightened out wavy, parted to the side, the exact same side usually, long, long long – needs to cut about three inches off to look current. It’s very MTV The Hills circa early 20s. Boring. I believe her long hair is her best beauty asset and that’s why she normally wears it this way. It sort of takes focus off her nose. Love everything but the shoes! The color of the coat is lovely for Spring! Why does she have her own SoHo apartment? Davina- You betcha! I do not suffer fools gladly.